June 16, 2017 - Ms. Penpa-Nga Suddhimondala (left), Vice President - Loyalty & Partnership Market Group, Total Access Communication PLC or dtac and Ms. Boonyanuch Boonbumrungsub (right), the Executive Vice-President of Bar B Q Plaza Business Unit, Food Passion Co., Ltd., announced a special privilege for dtac reward customers to try the new “Suk-Nua” menu at Bar B Q Plaza. The exclusive offer gives dtac reward customers a new dining experience with 2 sets – “Suk-Nua-Lek” at special price 379 Baht (from regular price of 399 Baht) and “Suk-Nua-Yai” at 579 Baht (from regular price of 599 Baht). 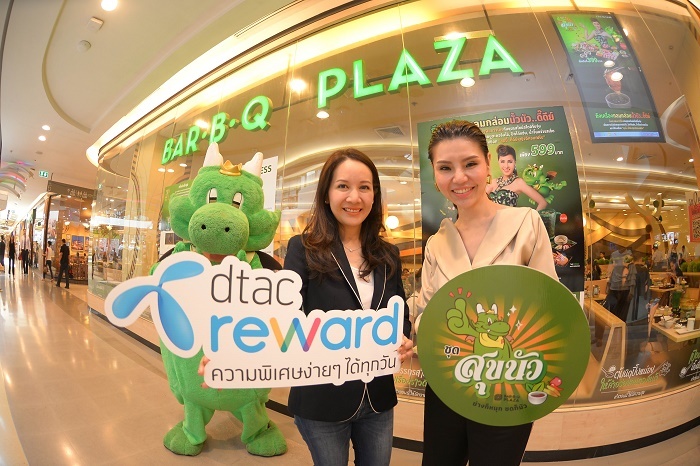 dtac reward customers can come and enjoy the new “Suk-Nua” menu at Bar B Q Plaza branches (only at the branches served with the brass grill pans nationwide). The special offer is valid from June 1 to July 16, 2017 and is limited to one privilege per number per month and a maximum of 49,000 privileges, worth 1,000,000 Baht, throughout the campaign. The new tasty menu with special privilege is waiting for dtac reward customers at participating Bar B Q Plaza branches nationwide. For more information about other privileges by dtac reward, please visit dtac reward LINE official account, dtac reward App or www.dtac.co.th/dtacreward.